The real Lewis and Clark expedition they don’t want you to know about! Every American learns the story: At the start of the 19th century, the vast West of the North American continent is unknown to white men who have colonized the East, so President Thomas Jefferson sends Meriwether Lewis and William Clark to explore the new frontier and report on what they find. MANIFEST DESTINY, the new hit comic book from Robert Kirkman’s Image Comics imprint SKYBOUND, begins with this familiar scenario, but where it — and Lewis and Clark — ends up is somewhere much different from what we learned in history class. 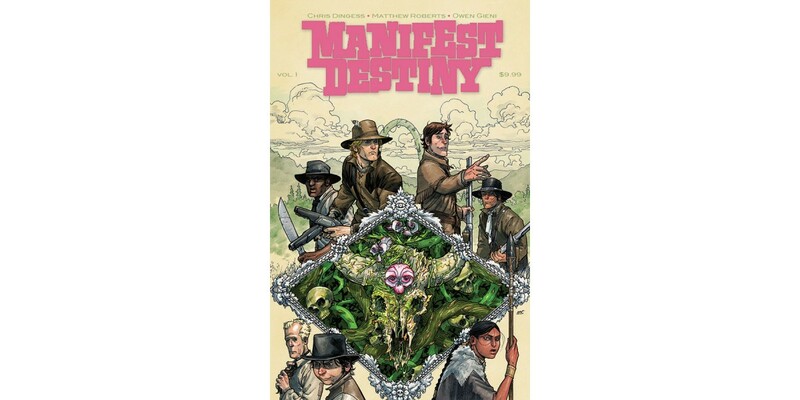 The first volume of MANIFEST DESTINY by Chris Dingess (Being Human) and Matthew Roberts (BATTLE POPE), out in May, chronicles their journey across the uncharted wilderness, where they encounter a most unnatural phenomenon. Aided by their crew of increasingly frightened men, French-Canadian explorer Toussaint Charbonneau and his wife Sacagawea, Lewis and Clark investigate a strange illness that turns living creatures into ferocious, mindless beasts. MANIFEST DESTINY VOLUME 1 collects the first six issues of the critically-acclaimed multi-sell-out series, and is a must-read for any fan of alternative history and horror-tinged adventure. It will be in comic book stores on May 14 and in book stores on May 27 and is has a special introductory price of just $9.99. “Manifest Destiny is the latest, and perhaps most vital, entry into the 'alternate history' genre that comics like to play around in quite often. It is also one of the most exciting and unheralded new books on the stands." "Manifest Destiny is one of those books that I look forward to every single month because I know it is going to entertain, enthrall and leave me wanting more. It is the kind of comic book that transcends and defies labels. It appeals to sci-fi fans, adventure fans as well as the overall comic book connoisseur, there is something in this book that will grab you and bring you back, trust me. If you haven’t been reading it give it a try, its good stuff."